For almost fifty years, Lawrence Ferlinghetti has been working to bring oral poetry back to the forefront of literary arts. The exciting work being done by slam, street, and performance poets these days owes much to Ferlinghetti. Back in the early 1950s, when he began writing poetry, much of the mainstream of American letters had become ossified by a kind of post-Eliot academic elitism. Rather than work in that stifling mode, Ferlinghetti worked, as he said in his first book, Pictures of the Gone World, to get “poetry back in the street, where it once was, out of the classroom, the speech department.” Ferlinghetti took as his models the poets from an older tradition of community-based bards like Sappho, Homer and Basho. Ferlinghetti’s lines were weird, sometimes broken into staccato, syncopated jazzy beats, sometimes as long and full of lists as his Yankee forefather, Whitman. Often his words weren’t pretty of fine. Instead his vocabulary was, like Wordsworth’s had been a century before in the Lyrical Ballads, the modern, colloquial language of ordinary people. In Pictures of the Game World, Ferlinghetti wrote about a woman hanging laundry, a Sunday painter, a card-carrying fellow whose teeth stuck out. The world these people inhabited was “a beautiful place/to be born into…if you don’t mind a touch of hell/now and then…” But these sad, regular people were also, despite their lusterless lives, still capable of desiring beauty, looking for it and sometimes even finding it in poetry or painting or love. Ferlinghetti’s next book, published in 1958, was A Coney Island of the Mind. One poem in this book compares the poet to an acrobat who must “perceive/taut truth/before the taking of each stance or step…toward that still higher perch/where Beauty stands and waits…” A lot of people -- more than a million readers of English and several other languages -- found Beauty, in Ferlinghetti’s poetry. They -- we -- also found a wonderful sense of the possible. You could be different than what you thought you had to be. I remember my big sister, seven years older than me, carrying A Coney Island of the Mind around with her for ages. She read it out loud with her smart friends and in her room alone while she listened to the cool, new music our father hated. Though we were living outside the U.S. then because of my father’s posting with the Navy, this book kept my sister in touch with what she needed to know about America so that when we came back to the states she knew how to act. As Populist Manifesto goes on to say, “Poetry isn’t a secret society.” Ferlinghetti’s poetry welcomed me and millions of readers to art and the idea that it can have a meaningful impact on the world. In addition to being the author of twenty-ish volumes of poetry, prose, drama, essays, and translation, Ferlinghetti has been immensely important to our culture as a supporter of the work of other writers. After serving in the U.S. Navy in World War II, Ferlinghetti received a master’s degree from the University of Paris, Sorbonne. He settled in San Francisco in the early 1950s where he co-founded, with Peter D. Martin, City Lights Bookstore, one of the first all-paperback bookstores in the country. By 1955, he had launched City Lights Books and the Poets Pocket Series. In 1956 Ferlinghetti published Allen Ginsberg’s Howl, was arrested for obscenity and tried in a landmark case that drew national attention to the Beat Movement. This case, which found Ferlinghetti not guilty, also established the legal precedent that controversial works with social redeeming value could be published in the U.S. 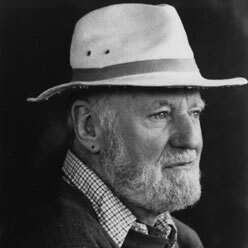 Throughout the Nixon years and the Reagan years, and Vietnam and Civil Rights and Women’s and Queer movements, throughout the wars in South and Central America, Ferlinghetti continued to work as a poet and publisher with a conscience, producing clear, direct, redeeming work about social responsibility, beauty, and spirit. Ferlinghetti’s work and life illustrates what poetry can do. It can astonish and move and gladden us, it can inspire us to be more, it can remind us of the beauty of our imperfect, wounded world. Broadside created by Paul Hunter/Wood Works Press for the poet�s reading for Counterbalance Poetry on Wednesday, April 11, 2001. Printed on hand-set metal type on archival paper with original woodcut. Limited to 200 copies.